Ardipithecus ramidus is a species of hominin classified as an australopithecine of the genus Ardipithecus. A. kadabba was considered to be a subspecies of A. ramidus until 2004. Ardipithecus ramidus was named in September 1994 as Australopithecus ramidus. In 1995, this was made a separate genus Ardipithecus. The first fossil found was dated to 4.4 million years ago on the basis of its stratigraphic position between two volcanic strata: the basal Gaala Tuff Complex (G.A.T.C.) and the Daam Aatu Basaltic Tuff (D.A.B.T.). The name Ardipithecus ramidus stems mostly from the Afar language, in which Ardi means "ground/floor" and ramid means "root". The pithecus portion of the name is from the Greek word for "ape". Like most hominids, but unlike all previously recognized hominins, it had a grasping hallux or big toe adapted for locomotion in the trees. It is not confirmed how much other features of its skeleton reflect adaptation to bipedalism on the ground as well. Like later hominins, Ardipithecus had reduced canine teeth. In 1992–1993 a research team headed by Tim White discovered the first A. ramidus fossils—seventeen fragments including skull, mandible, teeth and arm bones—from the Afar Depression in the Middle Awash river valley of Ethiopia. More fragments were recovered in 1994, amounting to 45% of the total skeleton. This fossil was originally described as a species of Australopithecus, but White and his colleagues later published a note in the same journal renaming the fossil under a new genus, Ardipithecus. Between 1999 and 2003, a multidisciplinary team led by Sileshi Semaw discovered bones and teeth of nine A. ramidus individuals at As Duma in the Gona Western Margin of Ethiopia's Afar Region. The fossils were dated to between 4.35 and 4.45 million years old. Ardipithecus ramidus had a small brain, measuring between 300 and 350 cm3. This is slightly smaller than a modern bonobo or female common chimpanzee brain, but much smaller than the brain of australopithecines like Lucy (~400 to 550 cm3) and roughly 20% the size of the modern Homo sapiens brain. Like common chimpanzees, A. ramidus was much more prognathic than modern humans. The teeth of A. ramidus lacked the specialization of other apes, and suggest that it was a generalized omnivore and frugivore (fruit eater) with a diet that did not depend heavily on foliage, fibrous plant material (roots, tubers, etc. ), or hard and or abrasive food. The size of the upper canine tooth in A. ramidus males was not distinctly different from that of females. Their upper canines were less sharp than those of modern common chimpanzees in part because of this decreased upper canine size, as larger upper canines can be honed through wear against teeth in the lower mouth. The features of the upper canine in A. ramidus contrast with the sexual dimorphism observed in common chimpanzees, where males have significantly larger and sharper upper canine teeth than females. The less pronounced nature of the upper canine teeth in A. ramidus has been used to infer aspects of the social behavior of the species and more ancestral hominids. In particular, it has been used to suggest that the last common ancestor of hominids and African apes was characterized by relatively little aggression between males and between groups. This is markedly different from social patterns in common chimpanzees, among which intermale and intergroup aggression are typically high. Researchers in a 2009 study said that this condition "compromises the living chimpanzee as a behavioral model for the ancestral hominid condition". "Thus, fundamental reproductive and social behavioral changes probably occurred in hominids long before they had enlarged brains and began to use stone tools." "Of course A.ramidus differs significantly from bonobos, bonobos having retained a functional canine honing complex. However the fact that A.ramidus shares with bonobos reduced sexual dimorphism, and a more paedomorphic form relative to chimpanzees, suggests that the developmental and social adaptations evident in bonobos may be of assistance in future reconstructions of early hominin social and sexual psychology. In fact the trend towards increased maternal care, female mate selection and self-domestication may have been stronger and more refined in A.ramidus than what we see in bonobos." "In the paleoanthropological literature, these changes in early hominin skull morphology [reduced facial prognathism and lack of canine armoury] have to date been analysed in terms of a shift in mating and social behaviour, with little consideration given to vocally mediated sociality. Similarly, in the literature on language evolution there is a distinct lacuna regarding links between craniofacial correlates of social and mating systems and vocal ability. These are surprising oversights given that pro-sociality and vocal capability require identical alterations to the common ancestral skull and skeletal configuration. We therefore propose a model which integrates data on whole organism morphogenesis with evidence for a potential early emergence of hominin socio-vocal adaptations. Consequently, we suggest vocal capability may have evolved much earlier than has been traditionally proposed. Instead of emerging in the genus Homo', we suggest the palaeoecological context of late Miocene and early Pliocene forests and woodlands facilitated the evolution of hominin socio-vocal capability. We also propose that paedomorphic morphogenesis of the skull via the process of self-domestication enabled increased levels of pro-social behaviour, as well as increased capacity for socially synchronous vocalisation to evolve at the base of the hominin clade." "We propose that as a result of paedomorphic morphogenesis of the cranial base and craniofacial morphology Ar. ramidus would have not been limited in terms of the mechanical components of speech production as chimpanzees and bonobos are. It is possible that Ar. ramidus had vocal capability approximating that of chimpanzees and bonobos, with its idiosyncratic skull morphology not resulting in any significant advances in speech capability. In this sense the anatomical features analysed in this essay would have been exapted in later more voluble species of hominin. However, given the selective advantages of pro-social vocal synchrony, we suggest the species would have developed significantly more complex vocal abilities than chimpanzees and bonobos." "This study has demonstrated that Ar. ramidus evolved its idiosyncratic skull morphology via paedomorphosis. In terms of cranial base angulation, length of the face and vocal tract ratios, Ar. ramidus shows greater affinity with infant and juvenile, than with adult chimpanzees...These findings provide further support for Gould’s (1977) contention that neoteny, or the retention of juvenile characters into the period of sexual maturity, was an important adaptive strategy in the hominin lineage. Gould proposed that the incipient process of hominization at the base of the hominin clade involved the dissociation of somatic growth from sexual maturation, resulting in the retention of sub-adult traits into the period of sexual maturity –which is what we see in Ar. ramidus." ^ Haile-Selassie, Yohannes; Suwa, Gen; White, Tim D. (2004). "Late Miocene Teeth from Middle Awash, Ethiopia, and Early Hominid Dental Evolution". Science. 303 (5663): 1503–1505. Bibcode:2004Sci...303.1503H. doi:10.1126/science.1092978. PMID 15001775. ^ White, T. D.; Suwa, G.; Asfaw, B. (1994). "Australopithecus ramidus, a new species of early hominid from Aramis, Ethiopia" (PDF). Nature. 371 (6495): 306–312. Bibcode:1994Natur.371..306W. doi:10.1038/371306a0. PMID 8090200. Archived from the original (PDF) on 2013-04-13. ^ Tyson, Peter (October 2009). "NOVA, Aliens from Earth: Who's who in human evolution". PBS. Retrieved 2009-10-08. ^ "New Fossil Hominids of Ardipithecus ramidus from Gona, Afar, Ethiopia". Archived from the original on 2008-06-24. Retrieved 2009-01-30. ^ Indiana University News Release. "Anthropologists find 4.5 million-year-old hominid fossils in Ethiopia". Archived from the original on 14 February 2009. Retrieved 2009-01-30. ^ a b Suwa, G; Kono, R. T.; Simpson, S. W.; Asfaw, B.; Lovejoy, C. O.; White, T. D.; et al. (2 October 2009). "Paleobiological implications of the Ardipithecus ramidus dentition". Science. 326 (5949): 69, 94–99. Bibcode:2009Sci...326...94S. doi:10.1126/science.1175824. PMID 19810195. ^ White, Tim D.; Asfaw, Berhane; Beyene, Yonas; Haile-Selassie, Yohannes; Lovejoy, C. Owen; Suwa, Gen; WoldeGabriel, Giday (2009). 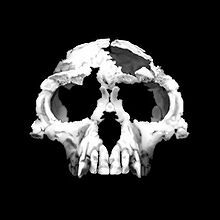 "Ardipithecus ramidus and the Paleobiology of Early Hominids". Science. 326 (5949): 75–86. Bibcode:2009Sci...326...64W. doi:10.1126/science.1175802. PMID 19810190. ^ a b Clark, Gary; Henneberg, Maciej (2015). "The life history of Ardipithecus ramidus: A heterochronic model of sexual and social maturation". Anthropological Review. 78 (2): 109–132. doi:10.1515/anre-2015-0009. ^ a b c d e Clark, Gary; Henneberg, Maciej (2017). "Ardipithecus ramidus and the evolution of language and singing: An early origin for hominin vocal capability". HOMO. 68 (2): 101–121. doi:10.1016/j.jchb.2017.03.001. PMID 28363458. Wikimedia Commons has media related to Ardipithecus. This page was last edited on 5 March 2019, at 21:58 (UTC).